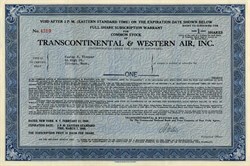 Beautiful certificate from the Transcontintental & Western Air dated in 1949. This historic document was printed by American Bank Note Company and has an ornate border around it. This item has the signatures of the Company's President and Secretary and is over 58 years old. TWA - (Transcontinental & Western Air) was formed on 16 July 1930 after a forced merger between three US domestic airlines: Western Air Express (W.A.E. ), Transcontinental Air Transport (T.A.T. ), and Pittsburgh Aviation Industries Corporation (P.I.A.C.). Prior to the merger Western Air Express was a sucessful mail and passenger airline using Fokker airliners. Transcontinental Air Transport was not doing so well but had important night flying experiences on their passenger/mail routes. Both had bought up many of the smaller airlines in their locales. Transcontinental Air Transport was incorporated in 1928. The Transcontinental Air Transport-Maddux Air Lines was formed from merger of Curtiss Aeroplane & Motor Co, National Air Transport, Pennsylvania Railroad, Wright Aero Corp, and St Louis businessmen. Western Air Express and Transcontinental Air Transport held 47.5 percent each and the smaller P.I.A.C. held 5 percent. The merger was forced after the Watres Act gave the U.S. Postmaster General sweeping powers over the airlines which held contracts to fly the US Mail over the trans-continental routes between New York and Los Angeles. After the merger the new air mail contracts were awarded with TWA winning the Kansas City to Los Angeles segment initially, on 25 August 1930.. The Postmaster General awarded TWA further segments of the trans-continental route despite lower bids by smaller carriers when he decided TWA was the best bet for the long-term stability of the air mail network. By 1933 TWA was the first US airline to fly a scheduled coast-to-coast route and was using dated Fokker aircraft. The trans-continental route was: Newark (New York) to Los Angeles. This route went from New York - Philadelphia - Harrisburg - Pittsburg - Columbus - Indianapolis - St. Louis - Springfield - Tulsa - Oklaholma City - Amarillo - Albuquerque - Winslow - Los Angeles. In order to speed up this trans-continental route (it initially took two days and used trains) TWA ordered a new all-metal twin engined passenger airliner from Douglas Company - the Douglas DC-1. There was only one DC-1 made (the prototype) and TWA flew it on a 'token' flight from Los Angeles along the trans-continental route to Newark in New York. It took only 13 hours and 4 minutes and set a new record. TWA was acquired by American Airlines in 2001.